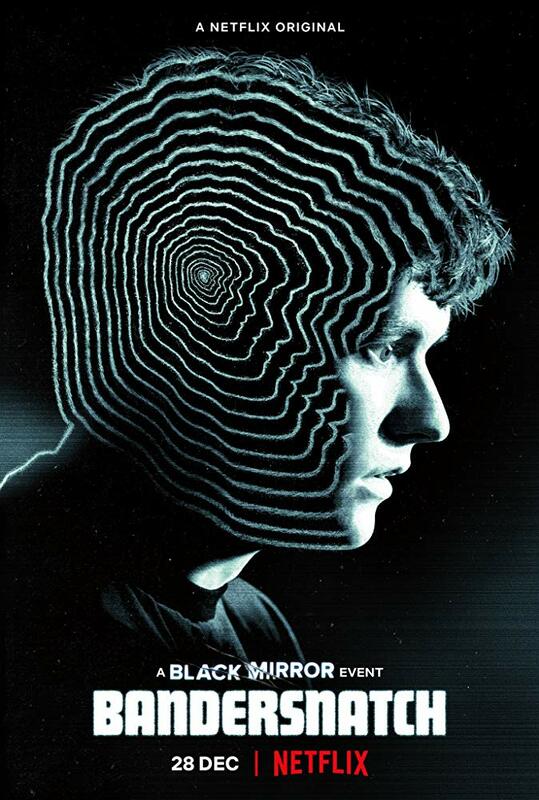 Starring Fionn Whitehead, Will Poulter, Craig Parkinson, Alice Lowe, Asim Chaudhry and Tallulah Haddon, Black Mirror: Bandersnatch is the latest entry in the Black Mirror series with a twist. Set in 1984, it follows a young programmer (Fionn Whitehead), who starts to question his reality when he attempts to adapt an epic fantasy novel into a video game. If you have seen some of my previous work on this blog, then you know that I’m a huge fan of Black Mirror. I can remember watching it when it wasn’t even a “Netflix Original” and being drawn into this realistic and terrifying world created by Charlie Brooker. Yes, it can be a really depressing show most of the time, but that’s why its brilliant. It takes a part of a technology that everyone uses and turns it into a horrifying (or sometimes heartwarming) scenario that’s clever and memorable. When I heard there was going to be a choose your own adventure style episode of Black Mirror, I was excited. I started to see others attempt this concept in the months leading up to it, but it never worked smoothly, or well in that matter. Now I can say that Black Mirror: Bandersnatch is the best example of this concept and although it isn’t perfect, it still nails the essential elements of both a Black Mirror story and the unique idea. First of all, I need to talk about the concept itself. We hardly see a film or tv show attempt a choose your own adventure story, and when we do, it usually fails. Yes, many video games (especially RPGs) have been doing it for years, but seeing it in the form of a movie is really exciting. When I sat down to watch it and saw the instruction video at the start, I was slightly worried. But then as soon as I made my first choice (Frosties for the win), I loved how well the concept worked. When you make a decision, the next scene depending on your choice plays as soon as the ten-second window closes. The further you progress, the better the system works, and without spoilers, it can lead to some amusing scenes. With an estimated five hours worth of footage, this will keep you busy for a while. With this being a Black Mirror “episode”, you can expect some of the usual Black Mirror tropes. The characters are interesting, the story is dark, and it kind of focuses on technology. But it’s also very different as this is a new setting for the series. The series is known for being set in the future or minutes from our present time, so an episode set in the mid-1980s is refreshing. Being able to see this world in the retro era is really cool, and the music is even better. David Slade also did a solid job with the direction. Slade had done a lot of TV work (Breaking Bad, American Gods and Hannibal are his most notable) before he directed an episode of Black Mirror back in its fourth season. Although I think Metalhead is one of the weaker chapters in the series, it still showed Slade’s ability to make a world feel real and craft tension. Here, David Slade has made this 80s era feel lived in and alive. You can almost smell the atmosphere. Considering the complex nature of this Black Mirror event, he has done well at crafting a series of dark and fun episodes (There’s basically five episodes in this). The sound, cinematography and production design blend together exceptionally well, and Slade’s work here is some of the best in the series. Speaking of exceptional, Charlie Brooker’s writing is as fantastic as always. The dialogue feels real, and the characters (especially Stefan and Colin) are some of the best in the series. I also love that the five main endings are all different and are amazing in their own, dark and messed up ways. Yes, you can say there is a “true ending”, and I personally think it fits with the story the best, but all the other endings and different outcomes are written well. The performances help bring these well-written characters to life. Fionn Whitehead is fantastic as protagonist Stefan. I love how you can see his character go from being a seemingly average person to something much darker. Fionn Whitehead brings Stefan to life with a nuanced performance that is easily one of the best in the series. But the most memorable performance of Black Mirror: Bandersnatch is definitely Will Poulter as Colin, a programmer who “helps” Stefan along the way. He does a fantastic job at playing this character who can be pretty meta at times. It’s a darkly funny performance, and Poulter continues to prove why he is one of the most underrated actors working today. Now, Black Mirror: Bandersnatch isn’t perfect. There are a couple of issues that take you out of the experience. One being the ninety-minute runtime itself. As I said before, I really like how the choose your own adventure style of the story works, but it would have been better if it ended once you get one ending. It encourages you to go back and try and get all the endings, which can lead to you feeling like it’s repetitive during the ninety minutes it gives you. Once that ninety minute is up, the credits play, and it’s usually after you get as many different endings as you can. For me, it would have worked better as a 45-60 minute movie/episode, which then encourages you to go back and revisit it for another ending. What happens here is basically letting you cheat, which takes the fun out of discovering the many different story paths and endings on your own. Because of this, it also feels like most of the choices you make don’t feel important because you know if its wrong, you’ll get to go back to that same choice and make another, instead of being punished and having to go back to the start. This would have been a perfect fit for Black Mirror as it is a show that likes to push TV to its limit. The punishment of having to start all over again would’ve made it even more unique and fresh, but then still this is just my opinion. Overall, Black Mirror: Bandersnatch is one of the craziest and freshest Netflix Originals yet. Taking what seems like an ordinary Black Mirror story and playing around with it in a choose your own adventure format is fresh and darkly fun. Yes, it may have its issues with the runtime and “cheating encouragement”, but Charlie Brooker’s clever writing, David Slade’s solid direction and fantastic performances make this Black Mirror event one that is both memorable and worth experiencing. If you really want to make the most out of it, watch it with a group of friends. It makes for a ridiculously fun time.